Muay thai (MT) is one of the oldest combat sports and is the national martial art of the Thai people. But within the past decade or so, it has taken off outside Thailand also. Known as the "art of eight limbs", the art is known for its ferocious kicks, adept clinchwork, beautiful sweeps and dumps, and brutal knees/elbows. The martial art is also known for its heavy use of padwork, especially for kicks. And if you ever want to get decent at MT or kicking in general, you will need a good set of muay thai pads. These pads come in all sorts of size and quality. But in this article, we will give you 7 great suggestions for curved thai pads. When shopping for thai pads, you will invariably notice that the pads are either curved or straight. Although the differences are slight, there are still important in helping you choose the right pad for you. If you are a beginner, curved muay thai pads are better for you because they are better at catching kicks. Because of the curvature already built into the pads, it makes a great target at the center of the pad. So it's a lot easier for the padholder to catch the kick and the for the kicker to target the center. And as you go on, the curve will get more prominent which will make kicking a lot easier the more you use it. Fairtex is synonymous with quality in the muay thai world. They put quality into everything they make and these kicking pads are no different. They are light-weight but thick so they can absorb impact without any problems whatsoever. I use a pair of these at the gym and they can absorb a lot of power. Because they are so thick and can absorb such good power, the kicker doesn't have to hold back on the kicks and the padholder doesn't have to deal with bruised and aching forearms. These pads also have a bullseye target at the center for punching also. The Sanabul thai pads are cheaper than the Fairtex pads but that doesn't mean it is not a quality product. 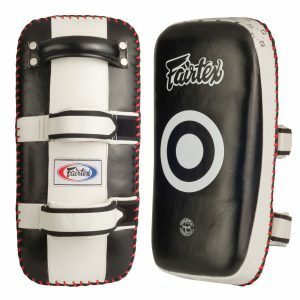 Like the Fairtex ones, this one also contains a center target for easier punching---the target being the brand image. Also like the Fairtex ones, they are also approximately 37 cm long. Although the pads are great for kicking and tough, they are also extremely light-weight as each pad only weighs 0.68 kg. Combined with light-weight material, Sanabul created the pads to disperse the impact evenly throughout the pad---making it less painful for the padholder. However, although they do design these pads to disperse the impact, they are still very light so you may have some problems with some of the bigger guys. 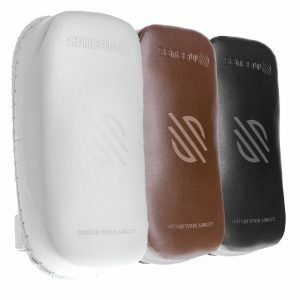 Like many other quality kicking pads, they are made out of (engineered) leather. And like many other great kicking pads---they fit securely onto the forearms of the padholder---the hook and loop velcro closure allows the pad holder to securely hold while having an easy time putting it on and off. The Meister XP2 is a slick-looking curved thai pad that is relatively new to the game. They just started selling these within the last year or so. 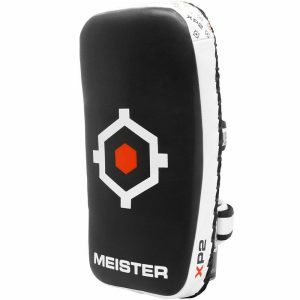 In general, Meister makes high quality martial arts equipment and these pads are no exception. Like many other high quality pads, the pads are reinforced everywhere so that it can weather the punishment of regular use. 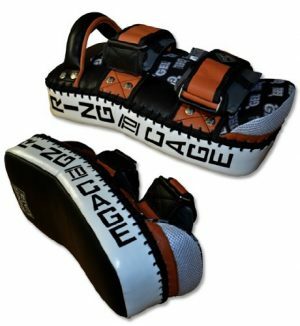 Like many other top muay thai pads, it does have a target center that is 11.4 cm (4.5 in) wide for you to focus your kicks and punches. Farabi is a relatively unknown player in the MMA world but don't let that fool you. 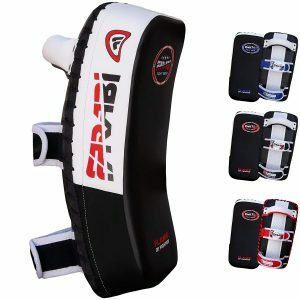 The Farabi muay thai pads makes the list for its quality and durability. Made from synthetic leather, these pads are a little shorter than some of the other thai pads on the list (34cm/13.4in long compared to the normal 37cm/14.56in). However, it makes up for it with its thickness, at 7cm/2.75in. These pads are extremely durable and really goes above and beyond to sustain the most serious kicks and punches. The pad itself absorbs shock through a state of the art EC-Gel C-Shock system. Despite being in a class of its own in terms of absorbing shock, these pads are also really light-weight so you can shuffle them from the gym to your home with no problems at all. If you are looking for extra thick pads, these are it. They come in at 9cm (3.54 in) thick. That's 2cm more than thickness of high quality muay thai pads. These pads are made of bicast leather (PU leather) and has reinforced velcro straps in the back. Although it is thick, some customers do complain that it doesn't absorb force quite as well as many of the other top pads on this list. If I had to choose, I would say that this one is my least favorite on the list. This is it. This is the cream of the crop. If you are looking to turn compete regularly and are looking for a pad that is designed to handle all the strikes allowed in muay thai, this is the one for you. 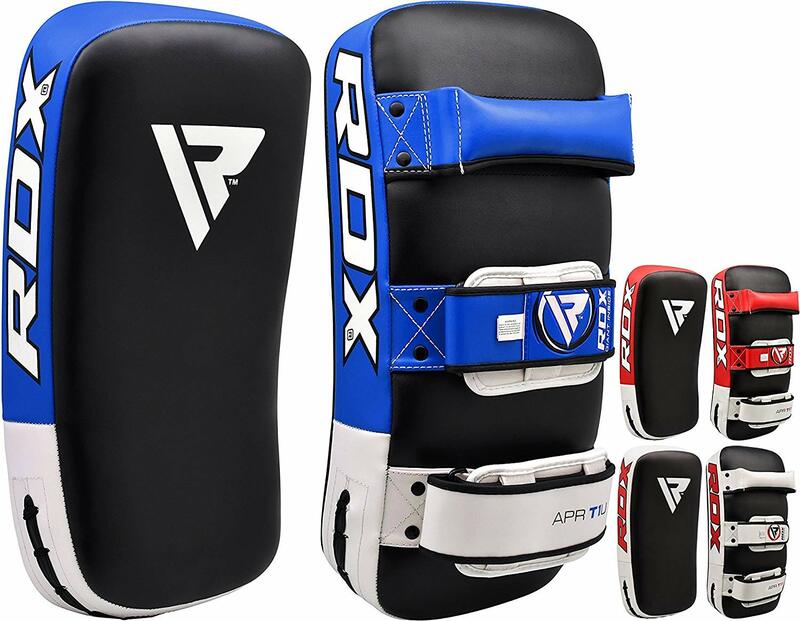 You will see that these pads look different than many of the other pads on this list---it's because these are meant to be just as good for handling elbows and knees as they are for kicks and punches. Made with extra-thick cowhide leather, these pads allow for maximum punishment on the pad and minimal punishment on the padholder's forearms. These pads are a little on the heavier side, weighing 1.29 kg (2.85 lbs). It is a little longer than most pads, 38.1 cm (15 in) compared to 37 cm (14.56 in) for most other pads. It is also noticeably wider at 20.32 cm (8 in) than most pads. It is also 7.62 cm (3 in) thick, making it thicker than most other pads. Although the Cheerwing pads are thicker in measurement, these pads handle force much better than the Cheerwing pads. So that's it. That's our review of the top 7 curved muay thai pads. 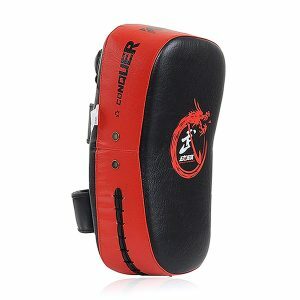 If you are looking for more in-depth review of martial arts gear, check out our reviews section.